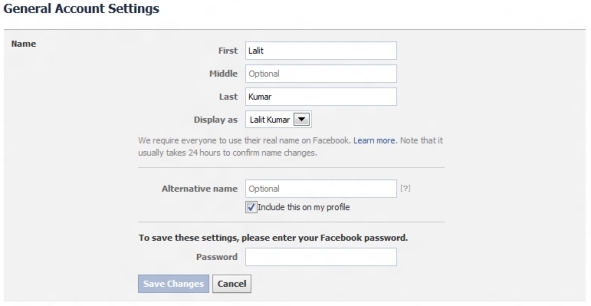 Facebook allows users to have an alternative name along with their real official name. Alternative name appears in grey color inside brackets right next to the real name. Facebook provides an option of displaying an alternative name in your profile. This name could be your nickname, maiden name, title, professional name or any other name by which you could be (or want to be) recognized. The entire Facebook system is based on the premise that profiles contain true information. So, you are supposed to write your official name as profile name. But sometimes people are better known by another name than their official name. In such cases alternative name comes handy. Enclosed in brackets, Facebook alternative name appears in grey font right next to profile name. To enter your alternative name, go to Account Settings. Then click on “Edit” next to the name. A new screen will appear which will show an option for entering alternative name. Facebook does not allow to use a different language for alternative name. You cannot have profile name in English and alternative name in, say, Chinese. After entering the alternative name, enter your Facebook account password and click on “Save changes” button. Facebook provides a checkbox labeled “Include this on my timeline” to toggle display of alternative name. You can uncheck this box and save changes to hide your alternative name. Be used to represent a business, organization, group etc. According to Facebook, if you have a large number of public subscribers, you may be prompted to verify your account when you add an alternate name to your timeline. Did you find this Facebook tip useful? Do you use an alternative name on FB? Please let me know if you have any questions about this matter. Thank you for using TechWelkin. Sir,I want to add my alternative name….but I don’t get the option of alternative name some 3 or 4 months ago I had did changes in my profile name after so from that day it says you can’t change your name for next 60 days..why is this coming ? please help.